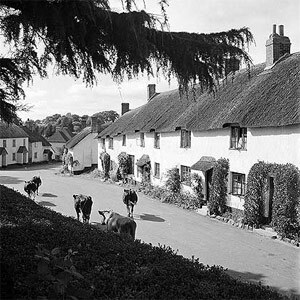 Broadhembury is a large parish of some 4700 acres and a population about 700 – it is situated on the extreme western end of East Devon district and the southern side of the Blackdown Hills with about a third of it being in the Area of Outstanding Natural Beauty. It is an interesting parish; its shape is much like that of the Indian sub-continent and is formed of two south-facing valleys which drop from North Hill on the Blackdown Hills to the level peninsula of Luton. From each valley runs the start of a river; through the Broadhembury village valley runs the embryo Tale River, which joins the Otter and eventually flows into the sea at Budleigh Salterton, and through the Kerswell valley runs the River Weaver – a less distinctive stream – which joins the Culm and then the Exe to enter the sea at Exmouth. The Broadhembury and Kerswell valleys contain the main settlements of the parish – Saxon manors in times past and with the varied landscape and land-type that the escarpment and river valleys offer. The manors are separated by Straight-hedge, which from north to south runs from the top of the escarpment of North Hill down to Colliton Moor, beyond Crammer. Crammer, being ancient Crane Mere, is where the earliest artefacts showing human occupation in the parish have been found. The parish is also divided east – west by the A373 road which goes right through Dulford and cuts off the main settlements of Broadhembury and Kerswell from the smaller collections of dwellings at Luton, Colliton, Crammer and St.Andrew’s Wood. Broadhembury takes its name from Hembury, an important iron-age hill fort on the southern edge of the parish. It is, however, North Hill which looms over both Saxon parish manors. Each was given to a monastic foundation in Norman times, Broadhembury being the largest holding of Dunkeswell Abbey and Kerswell the lands of a small Cluniac priory. At the time of the Dissolution of the Monasteries Broadhembury came to Thomas Wriothesly, Earl of Southampton and friend of William Shakespeare, who sold it to Edward Drewe. His son, Sir Thomas (knighted at the coronation of James I and VI), made the abbey granary his principal seat and this, as Grange, was the home of this family of Drewes for 300 years. The parish, despite being the home for three centuries of the Drewes ‘of Grange, Devon’, has managed to keep itself apart from the main turmoils and conflicts which have beset other parts of the county and country. As a consequence it has tended to go its own way under the auspices of a benevolent squirearchy and remain in a political backwater. Even when the ‘old’ Drewes (of Grange) had to sell-up after 300 years the ‘new’ Drewes (of Castle Drogo) kept to the parish’s traditions and thus families with long parish histories have been able to remain in the rented accomodation which Broadhembury village has provided. 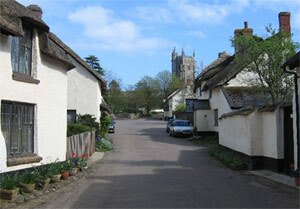 Broadhembury village is very much a unifying factor and very much the pride of the parish. St. Andrew’s church, dedicated by Bishop Bronescomb in 1259, has a simple interior and a fine peal of 6 bells. Its well-maintained graveyard is evidence of its value to the parish. The village’s thatched cottages, mainly 16th century but several of an earlier, medieval period, are mostly built from cob (mud, rubble and straw), though some are of local flint. Church Gate, next to the Drewe Arms, is probably the oldest and could have been the original Priest’s House. Broadhembury House itself was previously Culverhayes Farm. It was enlarged at each end and modernised in the early 1900s (see footnote), to be a fitting home for the son of Julius Drewe. In Kerswell the oldest house is Pales – probably the original home of the priory bailiff – with two windows which have never had glass in them. Kerswell Priory itself is a fine example of the development of a Devon building over the centuries. Baker’s Farm at Dulford is also very old and has unusual and attractive brickwork. Despite the vagaries of educational boundaries, telephones and post codes which seem to happen at this extremity of East Devon district, there is much that unifies parishioners in the enjoyment of the common community and the rural beauty of this lovely parish. Architectural footnote: The changes which made Culverhayes Farm into Broadhembury House were in line with the “Arts & Crafts” movement of the time; extensions to the existing farmhouse included a library at the east end and Servants Hall and Kitchens at the west. The road which ran along the front of the farmhouse was also amended and re-routed to provide todays sweep of drive. 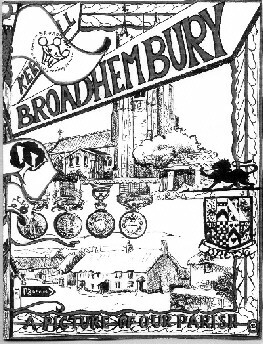 * “Broadhembury – a Picture of our Parish” (2nd ed. 2003; Ed CM Dunford): a comprehensive view of the parish including local history and geography, personal recollections and local knowledge from the time of the census of 1841. The stories and contributions of so many parish people make this a true reflection of those who have, and still do, make this parish so special. Available from Broadhembury Post Office or Mrs CM Dunbford, Spring Cottage, Kerswell, Cullompton, EX15 2EP. Price £12. + £1.50 P&P for postage in the UK.